When we first meet Dr. Otto Octavius, he seems a genial sort of man: well-liked, respected by his colleagues, and miraculously unscarred from the trauma of having been named "Otto". 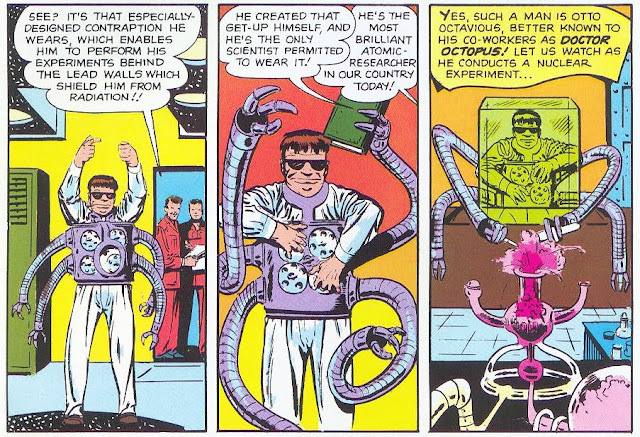 However, an explosive accident during his atomic research causes the metal arms he uses in his experiments to fuse to his body - and Doctor Octopus is born! Although we only get to see Octavius for about a page before his mind becomes deranged, what's interesting is just how abrupt this change is, and the idea of a man suddenly enslaved by his madness. In an era where most villains were evil just because, the astute reader quickly realizes that this isn't the way Otto has always been, and the tragedy of that original mind trapped within the broken one is poignant. A nuclear experiment?! Golly, yes! Let's watch! This seems appropriate a time as any to talk about story lengths, as the first two issues of Spider-Man contained two separate stories apiece, but here it's allotted the full amount - and, save for the occasional departure, things will stay that way. This is, on the whole, a good move. While two-stories-per-issue definitely has a great "bang for your buck" feeling - and no one can deny that the stories in those first two issues were well told - the fact remains that, due to the economy of space, stories only 10 or 12 pages in length aren't able to live up to their full potential. Since plot is the one thing that can't be sacrificed in an action narrative, the corners that are cut end up being the smaller details, the character traits, and the subplots. It's no coincidence that the most engaging Ant-Man story to date was the one twice as large (ha!) as the others, and the same effect is felt here. Without these extra details, Spider-Man might have been just another comic hero; with them, he's a Marvel hero, and the quintessential one at that. Not all of their future team-ups would leave the Torch as confused as this. The most obvious example of what would have been cut had this been simply another half-length story is the appearance of the Human Torch, called in by the city to stop the terror of Doc Ock. Since he needs time to recharge his flame, however, he agrees to first give a speech to the students of Midtown High on the merits of perseverance and never giving up. 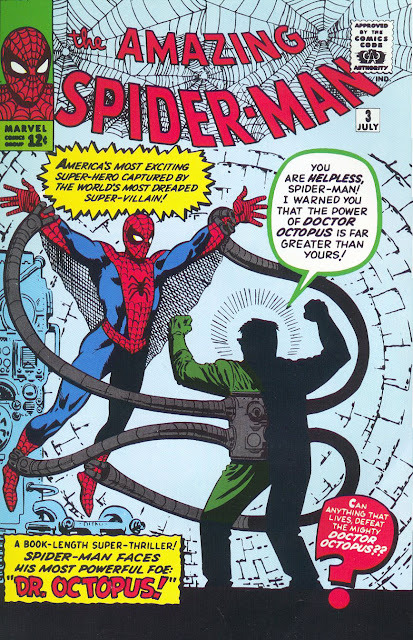 Though lasting only a single page, this memorable scene is a moment of Stan Lee genius, for while these words do deliver the jolt of encouragement that Peter needs after having been trounced by the Octopus in their first meeting, the true value for the reader is in the contrast this scene provides between the two teenage heroes. After all, Johnny Storm is a kid, like Peter Parker - but where Peter is a loner, an outcast, dismissed and disdained by his peers ... Johnny is a member of the universally loved Fantastic Four, superhero celebrities adored by their public and feted with honorary gala dinners. Despite their similar age, these two couldn't be more different - which is part of what will make their forthcoming friendship a joy to behold. it's a sure bet he's getting a karmic beat-down by page ten. Perhaps you've heard of the most famous lettering error of all time...?